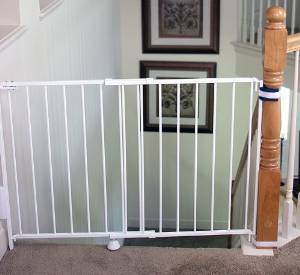 Baby gates for top of stairs will keep your child away from the stairway, one of the most dangerous parts of the house. Some of these gates can be angle mounted in areas without direct points.Some of them also expand to fit varied width measurement. These gates are designed differently when compared to standard types and therefore it is important to purchase a barricade with the right features. Such a gate should not have any threshold such as a bar or large lip at the base for stepping over as this causes tripping hazard. They should also be designed to swing in only one direction over the top floor and not over the steps as this can be dangerous and cause inconvenience when closing and opening. These barriers should only be hardware mounted to ensure secure installation by screwing them on the walls or on a banister. Most of the following described below are recommended for children from 6 months to 24 months.They can also be installed at the bottom of stairs. If you are looking for gates that will retract out of the way on your staircase,then have a look at the following hardware mounted gates.These gates are less inclusive and will also complement any decor. 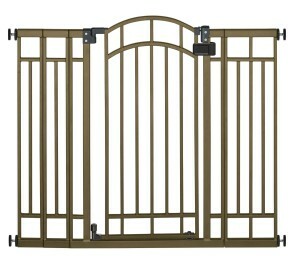 This popular metal gate has a bronze finish and sleek arched auto close walk through door. It fits openings from 28 inches to 31.5 inches without using any extension and up to 48 inches wide using the 3 included extensions where one extension measures 9 inches wide and each of the two extensions measures 4-1/2-inches wide.It measures 36 inches in height. The walk through door shuts and locks automatically and is a one-handed operation. This extra tall gate is PVC free and JPMA certified .It easily expands to fit an opening of 32 inches to 53 inches wide and is 35 inches in height.It comes with banister hardware mounting system that is ideal for mounting at the bottom or top of the stairway. It has a walk through door and allows for an easy squeeze of the latch so that adults can open without much effort. It allows inward as well as outward smooth gliding when passing through. It features secure and sturdy steel construction and is easy to install. This metal gate comes in decorative matte bronze color. It measures 31 inches in height. It fits openings from 28 inches to 48 inches.It is easy to install and it comes with hardware for secure mounting. It does not swing over the steps and does not have any threshold that can cause tripping hazard. It is operated using only one hand and is easy for adults to open and close. It is also easy to remove as you only have to unscrew and then lift it off.It easily swings out of way when not in use. 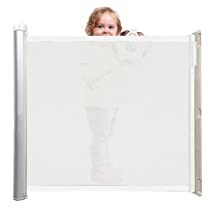 This sturdy metal gate offers one hand, easy adult operation during opening and closing. It measures 30.5 inches in height. It has adjustable width which allows it to fit openings from 27.25 inches to 43.5 inches wide. It has one-way open feature since it has a directional stop that prevents it from swinging out over the steps. It can be mounted on a surface that is angled. It comes with the required hardware in order to have it screwed on the wall. It has vertical bars that are not easily climbed over. 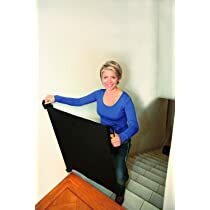 It doesn’t have any bottom bar that can cause one to trip over.It is a multipurpose barrier that you can use for kids, dogs or the elderly.It is also available in black color. 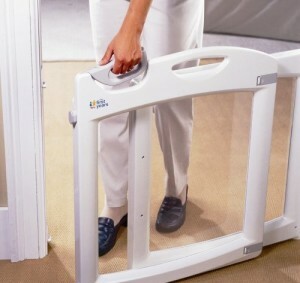 This is a multipurpose plastic gate that you can also use on doorways and hallways. It is easy to close and open using one hand in case your other hand is full. It measures 30 inches in height. It has adjustable width which allows it to fit openings from 27. 5 inches to 42.5 inches wide. 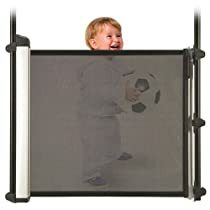 It has unobstructed clear plastic panels and it doesn’t have any footholds that can help kids to climb over. It has 2 convenient mounting options- pressure or hardware. When used at the stairway, it has to be hardware mounted by screwing it to the wall or to the frame. It comes with spacers for attaching to the wall in case of uneven walls. Check the video below demonstrating its features.